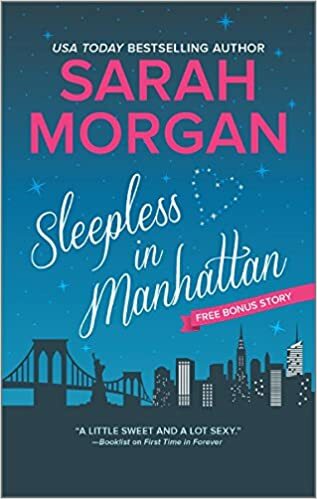 My first Sarah Morgan book was the wonderful Christmas Ever After, so I was really looking forward to this story. Sarah is a prolific author, though a new one for me, and I was hoping this would have that magic thread of drama and HEA that I so loved in Christmas…sadly though it was a fun story, full of real characters and problems, and a bit of heat it just didn’t hit the spot for a great read for me. Still, that’s how it goes, what one readers enjoys doesn’t work for another. I enjoyed the characters here, but they did feel a little “in the box” stereo-typed. Eva the incurable romantic, Frankie, who didn’t believe in romance at all, and then Paige. Paige was very ill as a child/teen and thus her family and Jake have always been overprotective of her. She wants Jake, has loved him for years yet he won’t make a move, even when she gave him an open chance when she was 18….Jake wants her he says, and yet he’s been happy enough to while away his time with endless models, quick flings, one month wonders at the most, and doesn’t exactly pine after her. I didn’t really feel any chemistry between them for a long while, and that kind of let it down for me. In Christmas I could feel that sizzle even though they both were sort of at each others throats, but here Jake treats Paige like a little sister, snarking and arguing with her each time they meet, and I didn’t get the sense their was unfinished business between them, that they really wanted each other badly. The story plays out well, the events they plan sounded great and I enjoyed all the descriptions of them, but the romance – well, it was a bit too pat for me, a bit too sweet and lacked any real drama. Even when there was a downside it didn’t last long. If you like a sweet romance,an even paced and relatively gentle one with a HEA you’ll love this, but it lacked the drama for me to lift it from a good read to a great one. Stars: Three, a good story just not a great one for me.